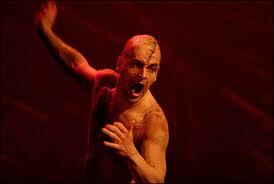 Shortly before Christmas, Maureen and I saw the two versions of the National Theatre production of Frankenstein. In the first we saw, Benedict Cumberbatch played the Creature, and Jonny Lee Miller played Victor Frankenstein; three days later we saw the other version, in which Miller played the Creature and Cumberbatch played Frankenstein. Since New Year I’ve seen the three episodes of the latest series of Sherlock in which Benedict Cumberbatch plays an updated Sherlock Holmes, and six episodes from the first series of Elementary in which Jonny Lee Miller plays an updated Sherlock Holmes. This doubling of roles casts an almost eerie highlight on the various productions. The different Frankensteins, or perhaps it would be more accurate to say the different Creatures, are revealing of the differences between the two Sherlocks. Let us begin with the first five minutes or so of Frankenstein. The stage is bare, except for an oval frame within which is stretched a thin, veined membrane. Through the membrane we can make out a shape. A percussive soundtrack accompanies this shape pushing, pounding against the membrane, until, at last, it breaks through, and a near-naked figure sprawls onto the stage. For five wordless minutes or more, the new-born Creature struggles into life, crawling, clambering, trying to rise to its feet and falling over again. Arms and legs shake spasmodically, breathing is a struggle, every minor victory is followed by defeat. When, after so much silence, so hard a birth, Victor Frankenstein marches onto the stage, sees the creature all knotted sutures and blooded flesh, and reacts with dread, it is truly heartbreaking. These opening minutes, before a word is uttered, define this National Theatre version of Frankenstein, and make it explicitly a play about the Creature rather than a play about its creator, as the title might lead us to expect. And it is in those first minutes that the differences between Cumberbatch and Miller are writ large. The reason we were able to see these two versions of the play so close together was that we were watching the filmed production. This was accompanied by a short film showing the play in rehearsal during the course of which Cumberbatch revealed that he had researched the role by watching severely mentally or physically damaged patients learn to use their limbs again, while Miller researched it by watching his new-born baby. Even if they hadn’t spelled it out like that, it would have been obvious just from watching the performances. Cumberbatch’s Creature was an adult remembering how to control its body; Miller’s Creature was an infant learning that its body could be controlled. Cumberbatch subjected his limbs to epic jerks and spasms that were frustrating because they weren’t behaving as they should; Miller’s body was weak and unsteady and surprising because he was still in the process of finding out what it could do. 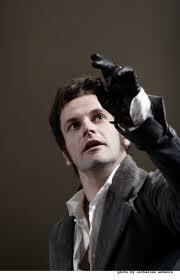 We were, I think, fortunate to see the two productions in the order that we did. Cumberbatch’s Creature was interesting, mostly because the physicality of the role didn’t seem to be natural to him, there was an air of acting against type, which is always interesting. 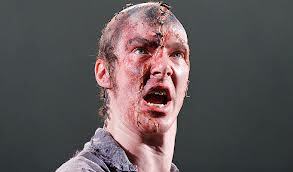 Meanwhile, Miller’s Victor Frankenstein seemed under-written, no match for the dominance, the charisma of Cumberbatch. But when we saw the alternative arrangement of the roles, we realised that Miller was rather stronger as the Creature, while Cumberbatch was significantly better as Frankenstein. The role of Victor Frankenstein still seemed to be under-written, but Cumberbatch is rather better at portraying stillness and thought than at physicality, so there was more sense to Frankenstein than there had been in Miller’s somewhat nervy portrayal. And it is here that the difference in their Sherlocks is rooted. First, let me make it clear that as television dramas neither of these two current versions of Sherlock Holmes is perfect. In fact, I think the BBC Sherlock is a mess that just gets worse. Given their involvement in the increasingly unwatchable Dr Who, I am rapidly coming to the conclusion that Mark Gatiss and Steven Moffatt are the worst things that have happened to television scriptwriting for many a long year. 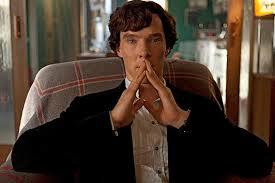 Sherlock started out as edgy and has become increasingly nervy. It is fanboy stuff where getting to play with familiar tropes and ticking every geek box possible counts for far more than sense, drama or characterisation. The whole clumsy, self-indulgent catastrophe is rescued only by the central performances of Martin Freeman (as Watson) and Benedict Cumberbatch (as Holmes). What I have so far seen of Elementary is better as drama, but it has significant weaknesses. For all its failure to create an intriguing mystery or a convincing solution, Sherlock at least pays lip service to the original stories by Arthur Conan Doyle. Elementary does not, although I understand that canonical elements begin to appear later in the series. Instead, the mysteries are fairly routine, the sorts of things you are likely to encounter on any run of the mill American cop show. It is as if the producers are providing a safe and familiar environment while their audience gets used to decidedly unsafe and unfamiliar central characters and relationship. 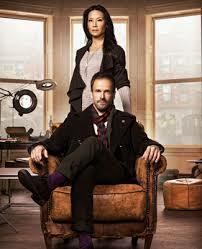 What lifts it out of the routine is, again, the performances of Lucy Liu (as Watson) and Jonny Lee Miller (as Holmes). As it happens, both series make Watson a stronger, richer, more engaged and more engaging figure than has usually been the case with dramatizations of Sherlock Holmes. But what I am most interested in here is how the Holmes of Cumberbatch and of Miller echo their different performances in Frankenstein. In a show as frenetic as Sherlock, in which the camera is in constant motion, scenes flicker across the screen almost before we can take them in, unreadable captions bloom and fade at high speed, the only choice is stillness. And this suits Cumberbatch, who is particularly fine at showing there is a mind working rapidly if invisibly behind that sharply chiselled face. His Holmes is also his Victor Frankenstein, a man so in love with his own thought processes that he has virtually no awareness of their consequences. (This Sherlock is not a sociopath, no matter how much Moffatt loves to tell us that he is.) When there is action (and every episode features a scene where he is running, just so we can relish the texture of that long coat), he becomes like the Creature, jerky, somewhat uncoordinated. Miller’s Holmes, on the other hand, is never still. Even at rest there are constant tics and spasms. In part this is playing up the addiction back-story, the drug dependency hasn’t quite left the body at rest. But that is, at best, only a part of the story. Holmes is an addict, yes, as he was in Conan Doyle’s original stories and in many previous dramatisations, but we need to remember that he is even more addicted to the quest than he is to drugs. This is the thrill of mystery taking him over physically. Where Cumberbatch’s Holmes has a hyperactive brain contained within the stillness of the body, Miller’s Holmes has a hyperactive brain leaking out into the ill-regarded body. The hyperaction in Sherlock is all on the screen around the stillness of Cumberbatch; the hyperaction of Elementary is all in the physical performance of Miller. In other words, Miller is playing Holmes in exactly the same way he played the Creature. Victor Frankenstein and the Creature are, of course, the same character. Like Jekyll and Hyde, the one represents the failures of the purely intellectual side of the personality; the other represents the failures of the purely physical side. In the pairing of Sherlock and Elementary, Sherlock Holmes is also bifurcated; Cumberbatch and Miller have each taken very different aspects of Conan Doyle’s original character. Cumberbatch plays him as a figure of pure mentation, the screen showing us what is going on inside his head; Miller plays him more physically, his body showing us what is going on inside his head. It is perhaps not too surprising that I find Miller’s performance the more amenable. Very engaging and intelligent analysis! 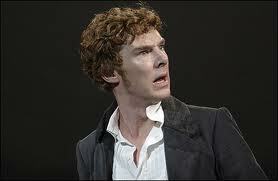 And as a Cumberbitch, I was hooked at the phrase “near-naked” in connection with Benedict Cumberbatch! I also appreciate you pointing out that the character as portrayed on this newer BBC Sherlock series is definitely not sociopath.